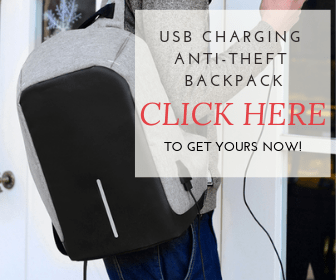 Tired of not having the clear images you’ve so long craved for? The Orion 10014 SkyQuest XT4.5 Classic Dobsonian reflector telescope may the solution for all your problems. This compact easy-to-use telescope with a 4.5 inches aperture will give you all the necessary clarity, so much needed in the celestial observation. Moon, planets, bright nebulas and galaxies will have no secrets for you, due to this powerful, yet affordable telescope. If you’ve been eyeing the Orion 10014 SkyQuest XT4.5 Classic Dobsonian Telescope dor yourself but don’t yet know what to think, our review here will tell you everything you need to know about this optical instrument. The quality of Orion telescopes is well-known, but let’s take a closer look now into this particular Dobsonian model. What is the Orion 10014 SkyQuest XT4.5 Classic Dobsonian Telescope? The Orion SkyQuest XT4.5 Classic Dobsonian scope is a Newtonian 4.5″ (114mm) diameter telescope. Having such a big diameter, this telescope will provide better images of the celestial bodies. Compared with a classic beginner 60mm telescope, for example, this scope will pull in 260% more starlight, providing clearer images with considerably more celestial objects and even fine details such as the Moon’s little craters, valleys, and mountains. You can even see Jupiter’s cloud band, Saturn’s rings, as well as different star clusters and nebulas. Orion SkyQuest 4.5 Classic Dobsonian telescope is an easy-to-use tool, suitable for all beginner and intermediate astronomers. As soon as you take this scope out of the box you can use it for your astronomical observation. No need for a tripod or for any other accessory to start your observation. This is a true Dobsonian telescope, which means that it has the left-right altazimuth maneuverability, making it extremely easy to use and also incredibly stable. The SkyQuest XT4.5 comes with a wooden Dobsonian base, meaning that in all moment the reflector optical tube will be on a safe and stable ground. The base also has some Nylon bearing pads, which prevent the scope from moving from position, allowing you to have a steady and free of frustrating vibrations view. CorrecTension is one of this scopes feature that worth being mentioned. CorrecTension Friction Optimization system will help you obtain a better balance of the optical tube, as well as full control of the motion. 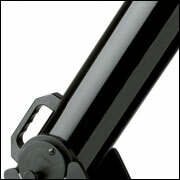 A huge plus of the Orion 10014 SkyQuest XT4.5 Classic Dobsonian Telescope is its portability. The entire telescope has only 17.6 lbs, making it not so hard to carry. Also, the telescope has an attached handle that makes this telescope easy to pack and carry to brand new observation points. 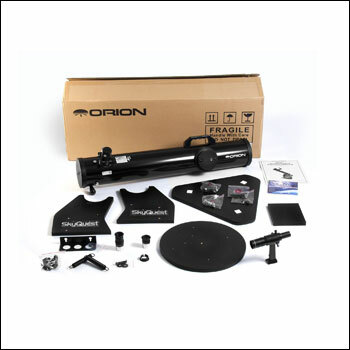 When you will receive the package with the scope, you will be surprised to find all the accessories with the Orion SkyQuest XT4.5 Dobsonian Telescope. You won’t have to buy anything extra, which is a huge plus for any scope and piece in general. Besides that, the telescope comes with two fully coated eyepieces of 25 mm (36x magnification) and 10 mm (91xmagnification), as well as a finder scope, which will help you start your astro-quest as soon as you get the piece out of the box. You may need to collimate your scope before starting to properly use it, but you will find all the info about how to do it in your telescope’s manual or on the internet, and after a while you will get used with the whole procedure. Aperture – for a Dobsonian telescope, this aperture is very small. Still, the telescope remains an amazing piece for all beginners. Case – the scope comes without a case or a bag. You will have to purchase the case separately, jut to prevent all dust to cover up your telescope. 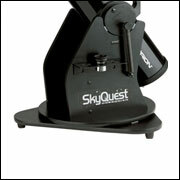 Where to Find the Orion 10014 SkyQuest XT4.5 Classic Dobsonian Telescope? Orion SkyQuest XT4.5 Dobsonian reflector telescope is a rather affordable telescope that will be a great asset for any beginner telescope. The price of this telescope is somewhere around $280, including all the pieces mentioned below, and this is a true bargain. 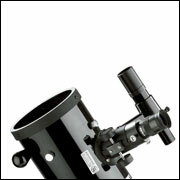 This telescope is easy to use and offers some of the clearest images of the sky. When purchasing this telescope, Amazon is probably the best place. Amazon prices for this telescope start from $280 & FREE Shipping. As a plus, Amazon offers a lot of discounts and special prices, so you may find this amazing telescope at the price similar with a usual department store telescope. Amazon’s customer support is quite impressive, you are sure that your product will arrive safely in a matter of days and in the case of a problem, you can return the telescope without any problem whatsoever. First of all, you need to pay attention to the place where you deposit your Orion 10014 SkyQuest XT4.5 Classic Dobsonian Telescope. Try to keep it in a dust and humidity free place. Also, remember to keep the eyepieces in their protective case or box. Whenever the scope is not in use, keep the dust covers on. Anyhow if the dust covers your lens, you will have to clean them. Be that eyepieces or mirrors, try to use a specialized lens cleaning fluid and a soft piece of cloth. Remember not to rub too hard as this may damage the scope’s fragile optical components. Also, the telescope’s mirrors should not to be cleaned so often, as this may damage the scope. Once a year would be the best period of time. Anyhow, as long as you don’t leave the telescope uncovered, there is a small chance to have dust on your lens or on your mirror. When purchasing the Orion SkyQuest XT4.5 Dobsonian reflector telescope, the piece will come with some really valuable accessories. First of all, the telescope comes with two Orion Sirius Plossl telescope eyepieces of 25 mm (36x magnification) and 10 mm (91xmagnification). The eyepieces are great and will improve your astronomical observation of any celestial body that is in your observation field. Secondly, you will find the collimation cap, which will allow you to collimate your scope. Also, the piece comes with an Orion 6×26 correct-image finder scope that will help you aligning your scope and have a better view of the celestial bodies. The least but not the last, the telescope comes with a Starry Night Special Edition astronomy software. This software will shorten your learning time by offering all the needed information about the stars and the universe. You can even program a sky gazing night with your friends or your family, by simply choosing one of the celestial events displayed by this software. This tool will make you go from beginner to pro in no time and with little to no effort. The Orion SkyQuest XT Dobsonian Reflector Telescope has a one-year warranty period. The telescope is warranted against defects in materials or workmanship. The producer will repair or replace, at Orion’s option, any instrument that proves to be defective. Do not abuse, mishandle, or modify the telescope, as the producer will not recognize this types of problems and it will automatically cancel the warranty. The same rule applies in the case of unauthorized repairs or modifications of the piece. 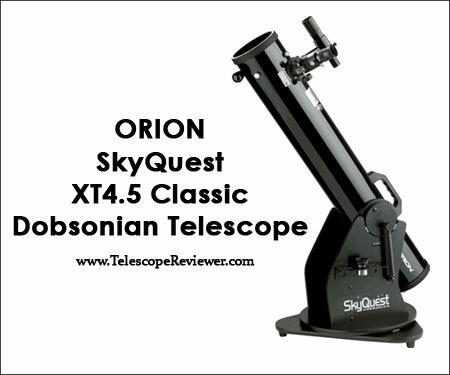 The Orion SkyQuest XT Dobsonian Reflecting Telescope is a great purchase for all beginner and intermediate level astronomers. Suitable for families, but not only, this scope will reunite the members of the family or just friends for a funny, yet instructive night of stargazing. Let yourself carried into the wonders of the universe with this remarkable Dobsonian telescope, which will guide you into the amazing world of celestial bodies.